I admit I am one that cannot survive without air-conditioning. 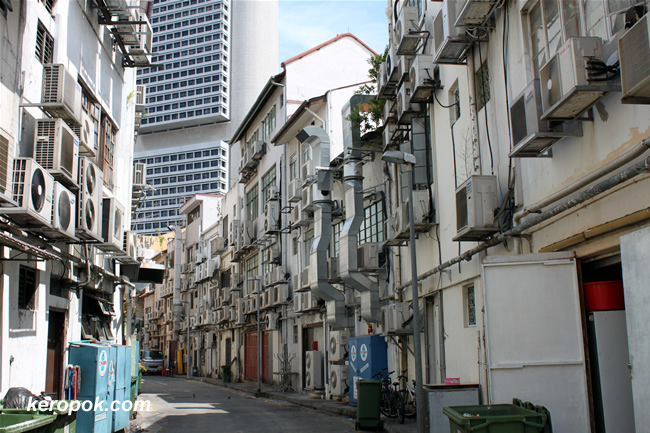 Just look at all the aircon condensers. Looks like I am not the only one. Blimey! That is a lot of coolers. They almost hide the buildings! I think you are in the majority not in the minority! excellent shot! so well captured huh? I belongs to the minority...lol. I prefer the fan than the air conditioning unless it is extremely hot. I guess living on the higher floors help. My two sons are like you...lol. Wow! That is a lot of air conditioning units. How much is your electricity bill a month? When I lived in NYC with A/C, I paid roughly $45/month in winter and $80/month in summer. Hmmmm i wonder if there's statistics available somewhere. sure or not? I thought they have this campaign in Spore that asks everything to set the aircon at 25 degrees C.
In the day time when I am at home, I use the fan. Only when I am sleeping at night, we turn on the aircon. Here it is summer all year long. It is around $90/month. It all depends on the oil prices too. The rates in Singapore fluctuate with the global oil prices. Nice shot and I was really amazed with those AC units. Thanks for sharing.